Living in a chemical free house has its good and bad days. Knowing that all of our cleaning products are gentle on both the earth and our skin, is ridiculously wonderful, but wondering if our environmentally friendly cleaners will be tough enough to tackle my next spill is sort of terrifying. 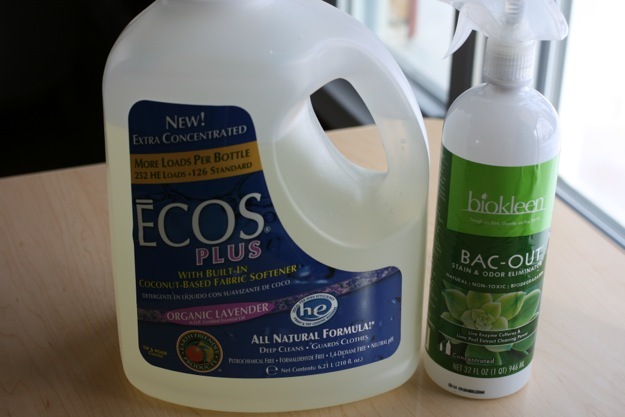 I did a little reading about the very best stain remover Moms are using to take out their very worst stains and decided to do a trial of the chemically filled un-environmental stain remover against the more green alternative. Here is what I found. 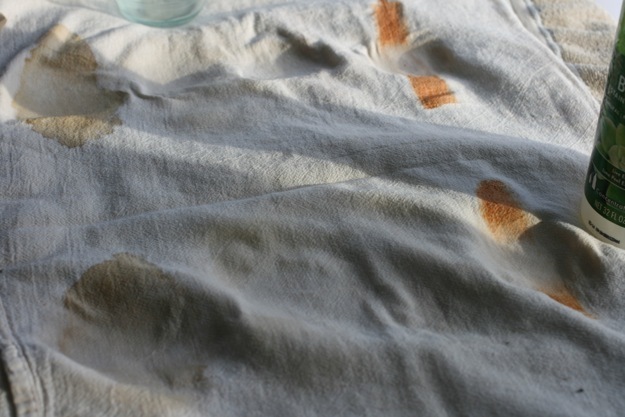 Before mixing anything up, I needed some stains. 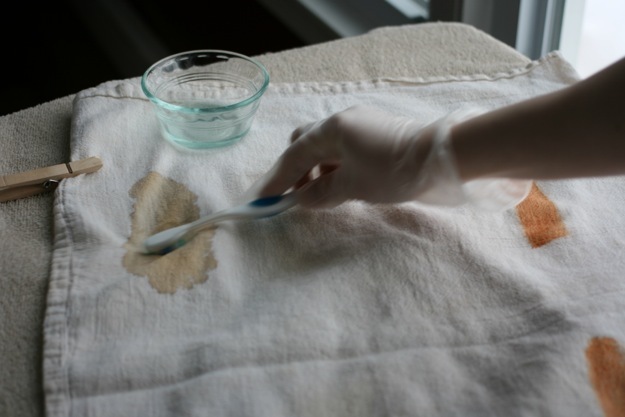 Our laundry is handled with eco friendly detergent and stain removers, so I created stains. The culprits are all natural ketchup, brewed coffee, 100% natural juice and extra virgin olive oil. 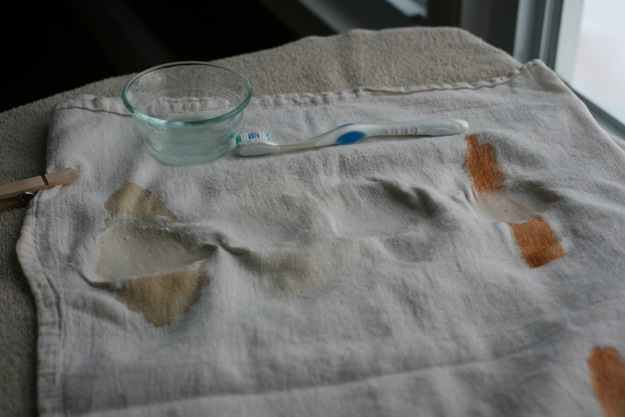 Using a clean, but very old dusting rag, I painted the stains on. 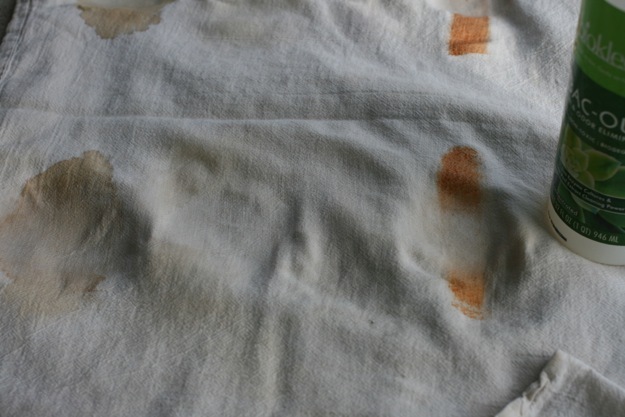 One set of stains on the top of the rag and one set of exact stains on the bottom. 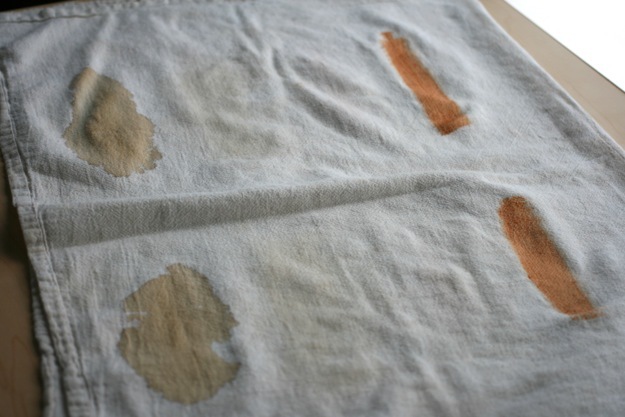 From left to right the stains are ketchup, juice, oil and coffee. I was surprised that 100% juice hardly left a mark. I took the cloth and hung it up for 24 hours to dry. I wanted these stains to really have an opportunity to sit. The next day when 24 hours was up I honestly thought these stains were permanent. 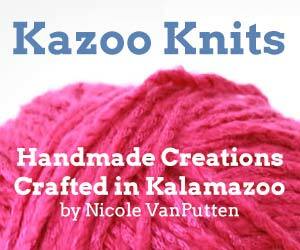 Our chemical free house has a box of products in the basement that cannot safely be thrown in the trash, so we are waiting until the spring to take them to the hazardous waste trash for the County of Kalamazoo. 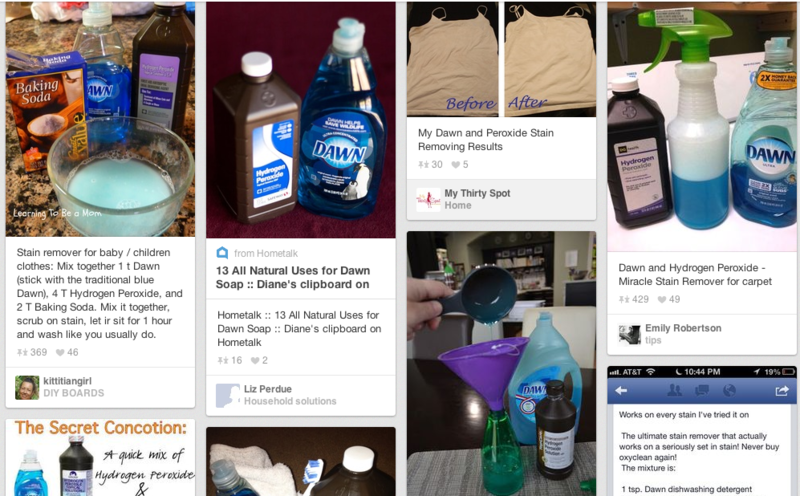 Dawn blue soap is a hazardous waste product. 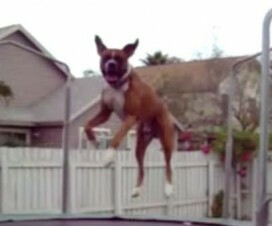 Scary right? I dug out the soap, grabbed the peroxide and some gloves from the first aid kit and went to work. 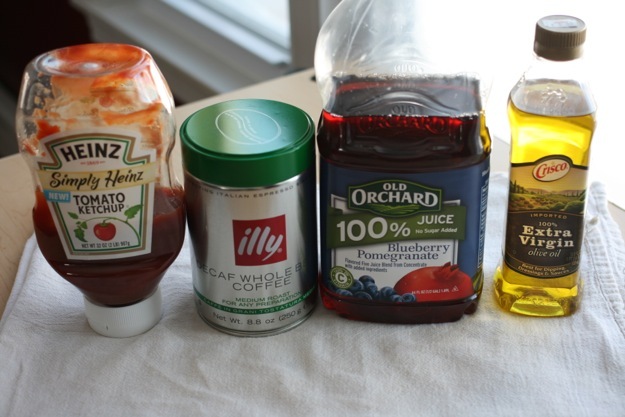 The miracle stain remover is fairly simple to make. If you have incredibly sensitive skin I would advise wearing gloves while handling Dawn. 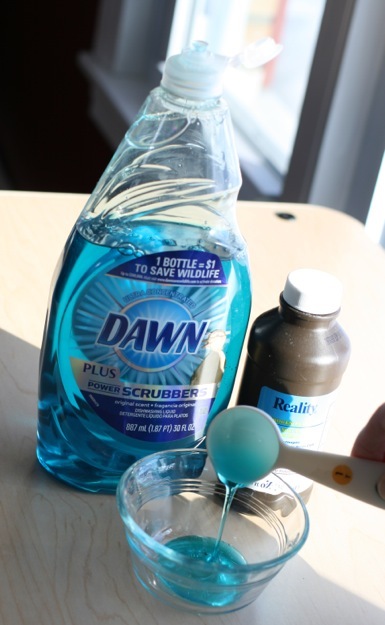 Add one tablespoon of Dawn to a small container. 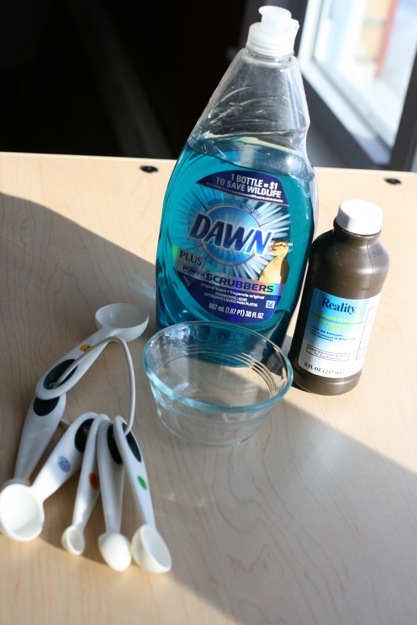 Stir in two tablespoons of peroxide. I used a toothbrush and scrubbed quite hard into all of the stains. There was noticeable improvement right away with the Magic Stain Remover. 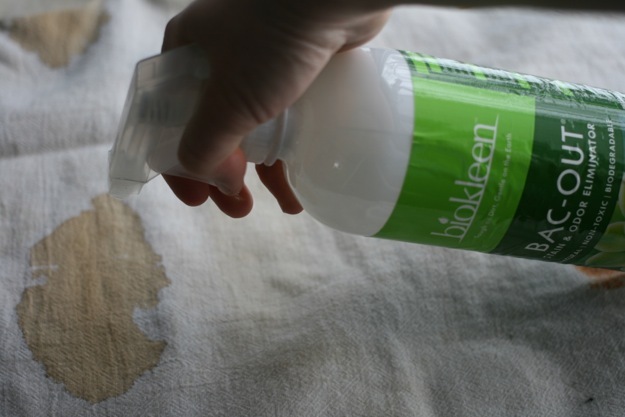 I took my gloves off, rinsed off the toothbrush and started on the second set of stains with our regular eco friendly stain remover, biokleen Bac-Out. I simply sprayed on the biokleen and scrubbed it in. Not the most exciting thing in the world, but procedure. 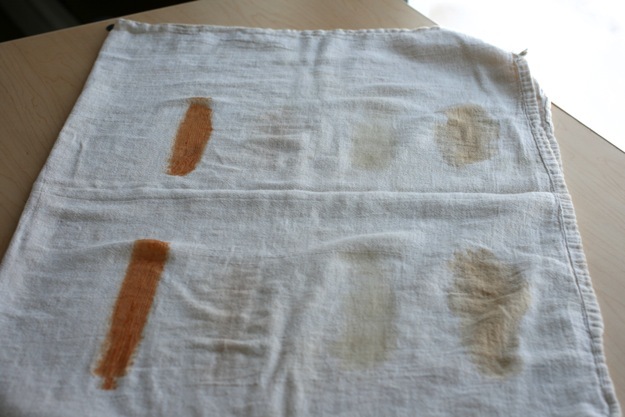 This is what biokleen did to the stains, which is better than what the Magic Stain Remover did. Biokleen removed more coffee. I let everything sit for an hour then I tossed the whole thing in the washing machine. I used our normal eco friendly detergent and hot water. 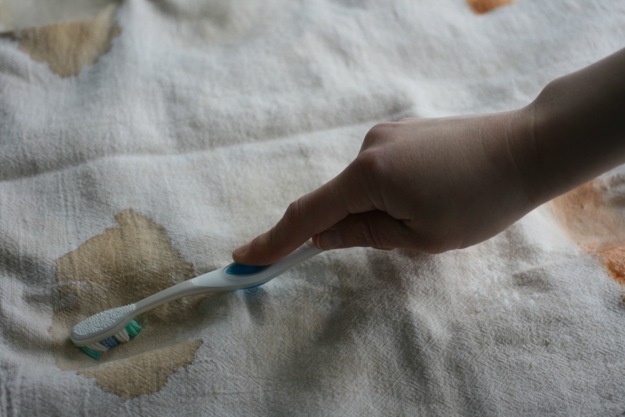 I put a clothes pin near the stains where I used the Magic Stain Remover so I would know which side of the rag was which. 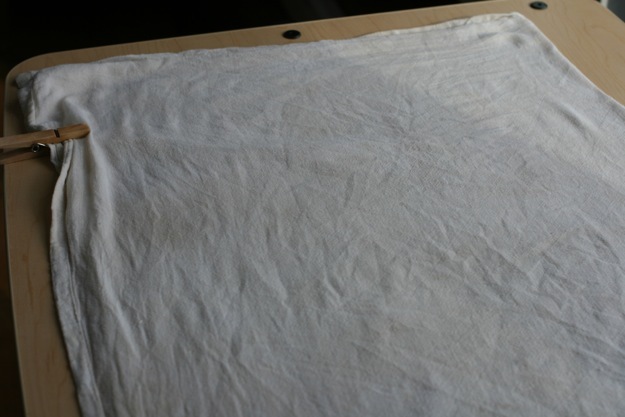 Here is the towel after coming out of the wash. The Magic Stain Remover and biokleen tied on everything except the coffee. Biokleen walloped Dawn on that. In our chemical free house I now feel completely confident that the products we use can handle anything we throw at them, even day old coffee stains. 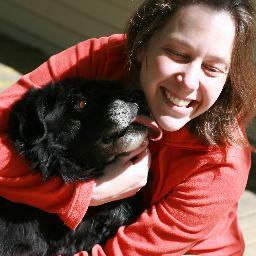 Member of Team VP, knitter and Mama to Blue and Franks. Life, is bloody good.  Nicole VanPutten Copyright © 2019.